Natalie’s 7th American Girl Gala! My American Girl has turned seven! Official birthday is September 26th, but we opened ‘Natalie’s Doll House’ on Sunday to celebrate her inner star with 16 of her closest doll-obsessed friends. Welcome to Natalie’s Doll House! This party was born almost a year ago. Haters, be kind. I am a planner and details are what make me happy, so a year is a must! Thankfully I have children who can stick with a theme once it is chosen! Bitty Baby at age 3. Noah named this doll Alice, because Natalie’s birthday theme was Alice in Wonderland that year. My boy is CRE-A-TIVE! Bitty Twins at age 4. Twins were named Jack & Jill….yep, the birthday theme was Mother Goose. Saige and Kit joined our family at age 6 and Sunday we surprised Natalie with ice skater Mia who was retired years ago. Hint: buy your dolls from your neighbors who are cleaning out their daughter’s bedrooms! I scored a used box from a different friend and voila, Natalie was in shock as to how we found Mia because “she is not even in the stores anymore”! I love it when a surprise pans out! One point for Mama. Sorry for the sidebar….back to the PARTY! I began saving boxes, bags and tissue paper and stock piling the free star stickers they give out at the store over a year ago. I had a vision of using 7 doll boxes with a picture of Natalie in each one. My original plan was for a picture for each year of her life. I changed my mind at the last minute and used all current pictures. So glad I did. I LOVE how it turned out and even Noah told me that it was very cool. Another point for Mama. I used a hot glue gun to create my box art. The party guests were hoping the boxes were filled with gifts for them! And the gum ball tubes made the perfect favors. Natalie chews gum ALL.THE.TIME…and the stickers from the store made them ‘official’ American Girl gum balls! Get the gum ball tubes HERE. A close up of the favor tag…I was pretty impressed with myself for coming up with that saying! Although I had to explain it to Natalie so I am sure it was as equally lost on her guests. Minus one point for Mama. Hopefully a mom to two appreciated it. When the t-shirt was complete we dressed their doll in their new shirt and a tutu and party hat. My super creative mom made the doll tutus and party hats! She rocks….really! Check them out…she is taking orders, email me for her contact info! You know you want to! In case you are wondering what we did with the clothes the dolls came in, well… I had the tutus and hats (and some AG stickers) in a bag labeled with each girl’s name. Their doll clothes went into their bag and I am happy to report that nothing was left behind. Whew! Again, I used the stickers from the store for their goody bags! FREE! It’s not a party without games! We played Doll Bingo and Pass Kit! Jeremy was an excellent Bingo caller and was very patient as the girls found the right doll on their card! I was racking my brain as to what to use as markers for the Bingo cards. At first I thought of something edible, but I didn’t want to ruin the cards (I will use them again, I’m sure of it!). Buttons? Pennies? Beads? They would have all been just fine, but the DETAIL OBSESSED part of me was not content. The Bingo gods spoke to me and I remembered the bucket of doll house miniatures that belonged to my Grandma Dortmund that Natalie loves to play with….perfect! The girls were so into the little items and it made the game much cuter! Buy your custom Bingo cards HERE. Teddy Grahams (two flavors of course), Pretzel Rods (love how they can be displayed), Bagged Apples (with caramel dip…bonus! ), String Cheese and Grapes. Easy peasy! The girls were happy once their plates were full. she actually hates to be the center of attention (or have her picture taken, but that is a blog post for another day), so the yearly, “Gather around Natalie, stare AT her and sing TO her” announcement most likely makes her cringe. She is a good sport though and even managed a smile during her special song. It might be the adrenaline rush of the party or the teeny, tiny reminder that she cannot open her gifts unless she smiles for my pictures! I am a sucker for iced cookies, anyone else? Once upon a time I made them myself and spent endless hours perfecting my decorating skills. Let’s just say that decorating cookies is HARD! I have decided to leave it to the professionals. My Cookie Diva can be found HERE. Let’s talk drinks! Natalie loves lemonade and its cheap and easy so I said yes! A couple of years ago it was mini cans of Fanta, so I was super excited about lemonade! I’m a big fan of lids when little ones are involved and actually started using the Mason jars before they were blowing up Pinterest 🙂 I am pretty sure I got the idea from my Grandma Dortmund…she was a thrifty lady! I strongly suggest you buy a case of jars for your future parties. You will save tons of money in the long run! Add some fancy lids and colored straws and sit back and pat yourself on the back! I added stick-on chalkboard labels for this party. A few girls begged me to take their glass home. Sorry sisters! A few years back my very creative friend, Sarah from Pennsylvania celebrated her American Girl with a star-studded affair. Sarah likes to throw over the top themed parties too (one of the many reasons we are friends!). This particular party included a life-size doll box for the girls. I stole her idea and Jeremy and I set out to create a box for Natalie. It is adorable if I do say so myself…. Wanna make one for the doll in your life? Head to U-haul and buy a Sport Utility Box. Next, stop by the hardware store and buy a couple cans of red spray paint, a small jar of white paint, a few rolls of white electrical tape and you have the fix-ins for a one-of-a-kind doll box! We measured Natalie for the face hole and Jeremy’s circle cutting skills did not disappoint. Thank goodness he listened in math class and was able to MacGyver some sort of contraption with string, a thumbtack and an Exacto knife and I was presented with a perfect circle. I love a man who is not afraid to craft! I used a cross stitch hoop (I grew up with a sewing mama, so these were on my radar) to make the perfect circle around the face hole. I had nightmares about stenciling the stars on the sides of the box, but JoAnn Fabrics saved me the day before the party. Moment of poor planning…I finished the box about 20 minutes before the party started! YIKES!! Anyway, I bought adhesive paper in pink and white, traced some stars and slapped them on the box! Since I am a tech idiot and could not figure out how to download the American Girl font to my computer I did the next logical thing and cut the logo from one of their bags and taped it to the box! We took a picture of each party guest in the box and will include a copy in their thank you note. The girls loved the box! One friend asked if she could borrow all my ‘stuff’ for her party. This same guest told me that I had really “upped my game” this year! Little girls crack.me.up! I always take a group party picture. My kids LOVE looking at them years later. It’s fun to remember who celebrated with them. This year we had to include the dolls…and silly faces! We ended the evening with dinner from Donato’s, a few cold beverages for mama and daddy and lots of fun presents to open! My American Girl went to bed happy and loved. She fell asleep with her arms around my neck after thanking me for her ‘best birthday ever’! That day will forever be etched into my memory. It was my second year in Pennsylvania. I was on my way to North Hills Elementary School to prepare for my day of teaching 5th grade. For some reason I called my parents from the car. My commute was all of 10 minutes and I don’t think I had ever called them for an early morning chat before, but I did on this day. I had no reason to call, but we talked for a few minutes, said ‘I love you’ and ended the call. I remember it being a beautiful day. The sun was shining. My class was happy. Our morning was productive. The kids went out for recess and that is when my day changed from beautiful to ugly. A fellow teacher came running into my room with her hand covering her mouth saying, “Oh my God, New York City is under attack.” ….she hustled to my TV and switched on the news. Utter disbelief. This could not be real. We watched for only a few minutes before our principal told us to bring the kids inside. Moments later I was staring into the eyes of 24 fifth graders, trying to hold back the tears as I told them something terrible had happened in NYC. They had questions and I had no answers. Fortunately we were scheduled for a half day so I encouraged them all to watch the news with their parents and promised them we would talk about it in the morning. Once the building was kid-free, we teachers gathered in front of the television and watched in horror as our country was being attacked. We were due in meetings, but our principal told us all to go home. You see, we were only an hour away from Washington DC, and not far from where Flight 93 went down. Tensions were high, fear was out of control. I got in my car and drove home. I was scared. I wanted to talk to Jeremy. He was doing surgery that day at Sinai Hospital in Baltimore. He was not answering his phone. I called again and again. No answer. I called my parents and sat in front of the television, frozen. Jeremy finally called. I took a deep breath and told him to please hurry home. I did not want to be alone another minute. 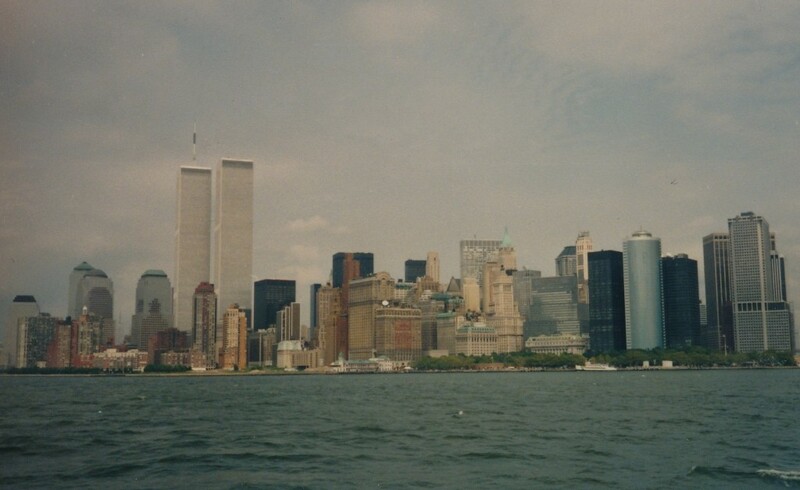 My life changed that morning as did each and every true American. My heart was broken for the lives lost, families torn apart and sense of security that was crushed. The toughest part for me was trying to explain it to my fifth grade friends for the days, weeks and months after. I’m not sure if I helped them get through it or not, but I know I will never forget that class and the discussions we had that year. New York City is a place I love. 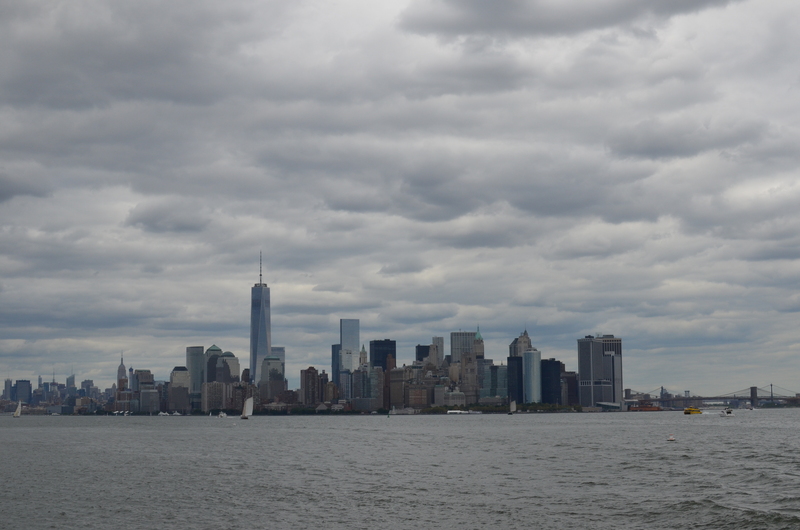 I have been numerous times and plan to devote a blog (or two) to the Big Apple. It is full of wonderful people who stood up to the terrorists and persevered. I cannot begin to imagine their grief, but I shared in their pain and offered up many prayers on their behalf. 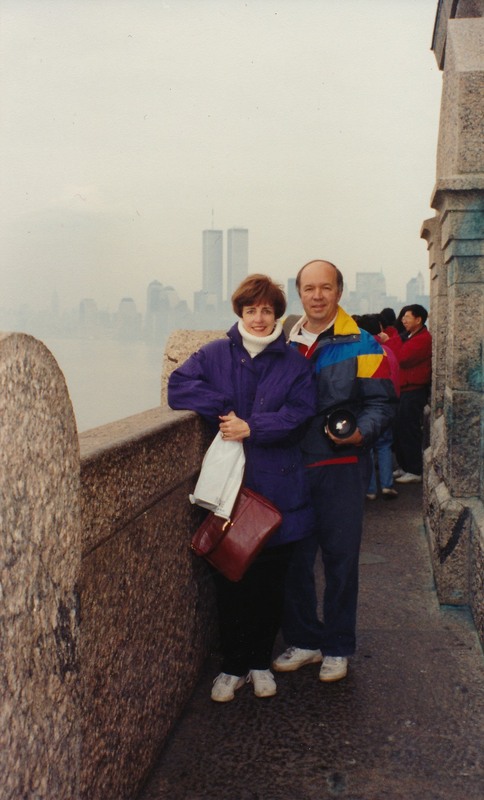 My folks on our family trip, 1993. 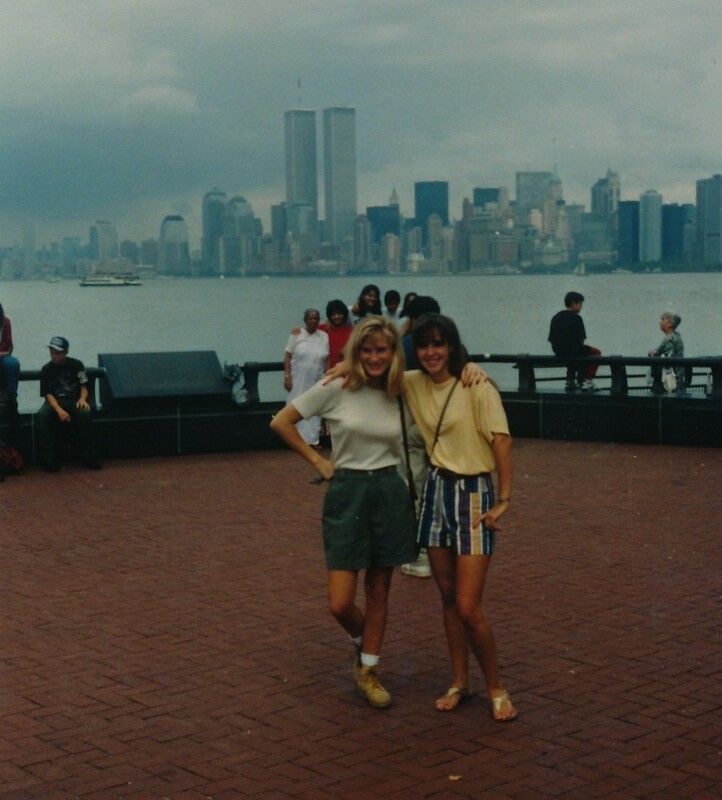 Myself and a friend on my first trip to the city without my dad, 1995. 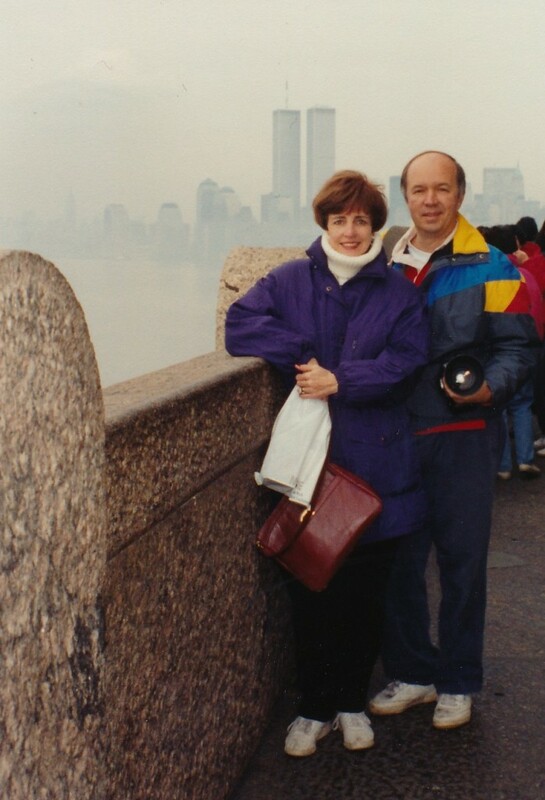 Go ahead and chuckle at my fashion choices for that day of sightseeing in 1995. It was summer, stripes were in…oh how I wish I still had those gold sandals! Apparently I have been rocking the cross body purse approach for some time! And please, take a moment to truly appreciate my friends ‘construction’ boots! Jeremy and I spent a few days in the city just last month (celebrating our 10 year anniversary!). This trip included a visit to the 9/11 Memorial and Museum. I cried. I shook my head. I said a few bad words. We left in silence. The memorial is perfect. The museum is a beautiful building of respect for those who lost their lives. Put it on your bucket list. Take your kids when they are old enough to appreciate it. 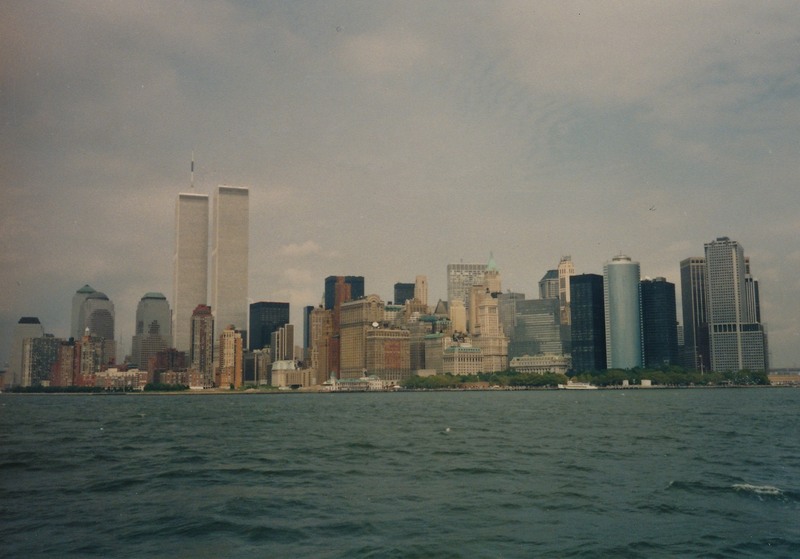 Visit NYC for it is still an amazing place filled with strong, beautiful, brave people. A small pat of the 9/11 Memorial. 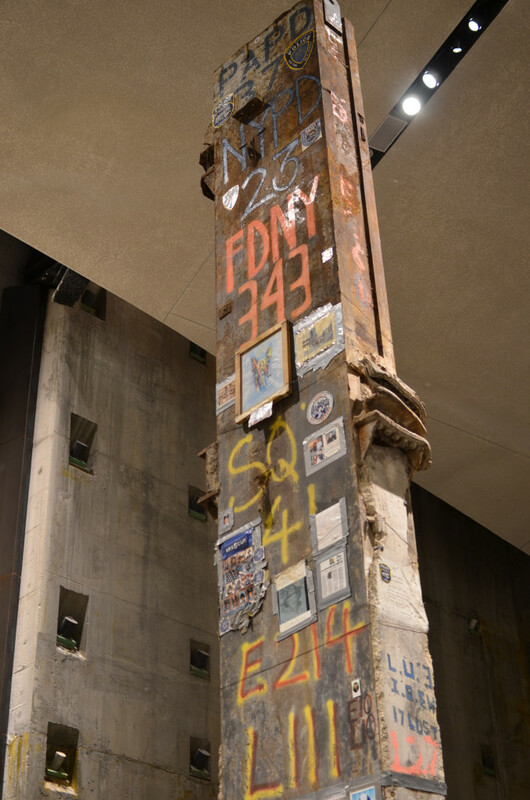 A support beam from one of the towers. 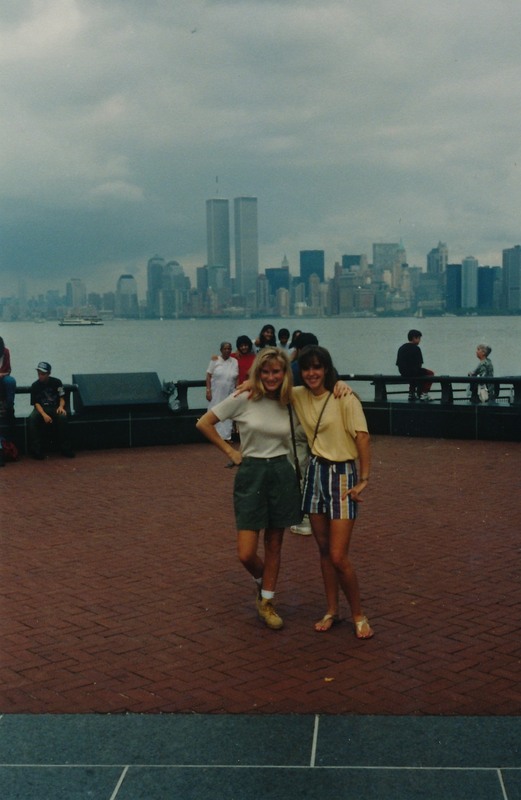 We all have our own story to share about September 11, 2001. I encourage you to share it today. With a friend. With your child. With a stranger. Keep it alive. Keep it important. Learn a name of a victim and pray for their family. I chose Kenneth Basnicki. 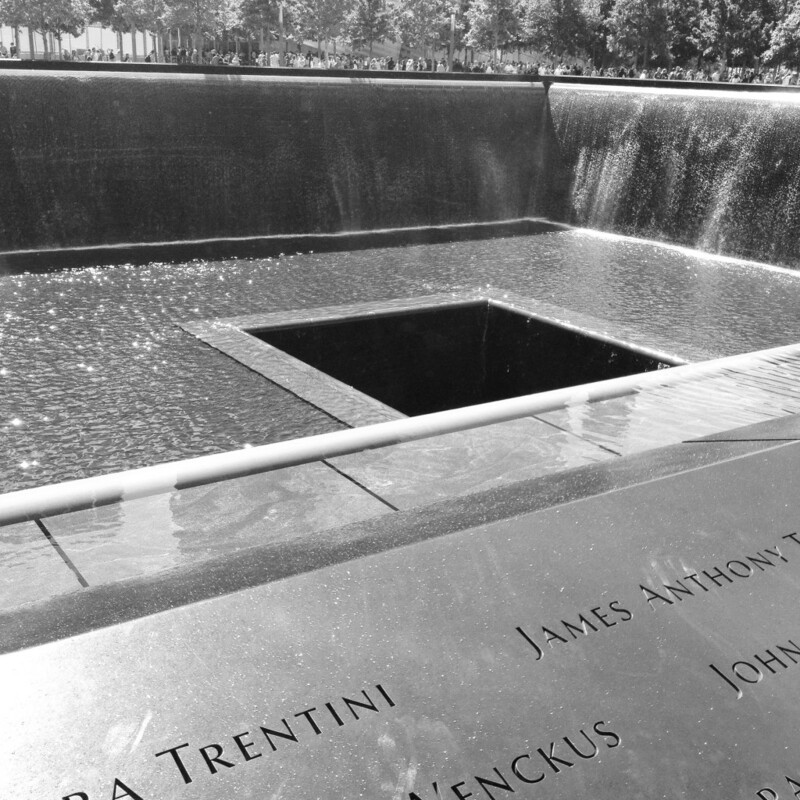 HIs name was the first name I noticed as I came upon the Memorial for Tower One. 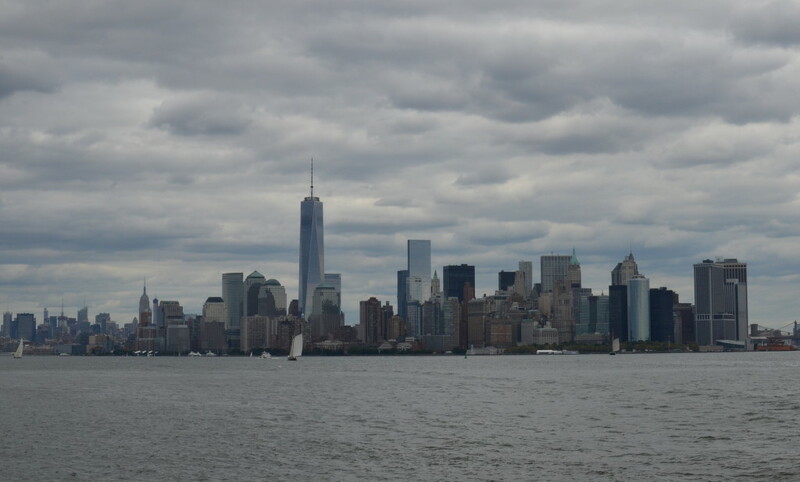 The new skyline, again, taken from the Statue Ferry, 2014. P.S…..several hours before taking this post live I had lunch with some of my fave girlfriends. Naturally the conversation turned to today. We shared our “where were we” moments. Each memory was vivid and real as they should be. So glad I get to call those ladies my friends. Well, I have finally made this whole blog thing a reality. Find a comfy seat or park your car and let me tell you how ‘Mathis Style’ came to life…. If you know me, you know I love to chat. With friends, my sweet family, random kids on planes, cashiers at checkouts, strangers at restaurants, pretty much anyone who makes eye contact with me! I often find myself in mini conversations with loads of people throughout the day and I love it. Yes, it takes me about an hour to leave a party and my kids always seem to squeeze in an extra 15-20 minutes of playtime when I pick them up because their mama is chatty. Luckily, this does not seem to faze my husband as he is guilty too! In addition to being a chatty one, I really do love to write and tell stories. As I took a stroll down memory lane I realized that I have always been writing….diaries, scrapbooks, letters, journals, cards, lists (sometimes just so I can cross things off), emails, a cancer site for my dad, poetry….I even liked the creative writing assignments in college and these days I am a big fan of texting; thank you to that techy person! And yes, texting counts as writing! People ask me a lot of questions. I must have one of those faces that draws people in…or it could be because I stare. I tend to stare a lot. I am intrigued with people! Thank goodness for dark sunglasses! Seriously, I love sharing ideas, comparing notes, swapping stories, getting advice; I love interacting with people! I am that person who wants to know where you bought your adorable shoes (so I can get a matching pair), how you manage to work all day and get a meal on the table, what did you buy your husband for Christmas…anything and everything is fair game! What am a I going to blog about? 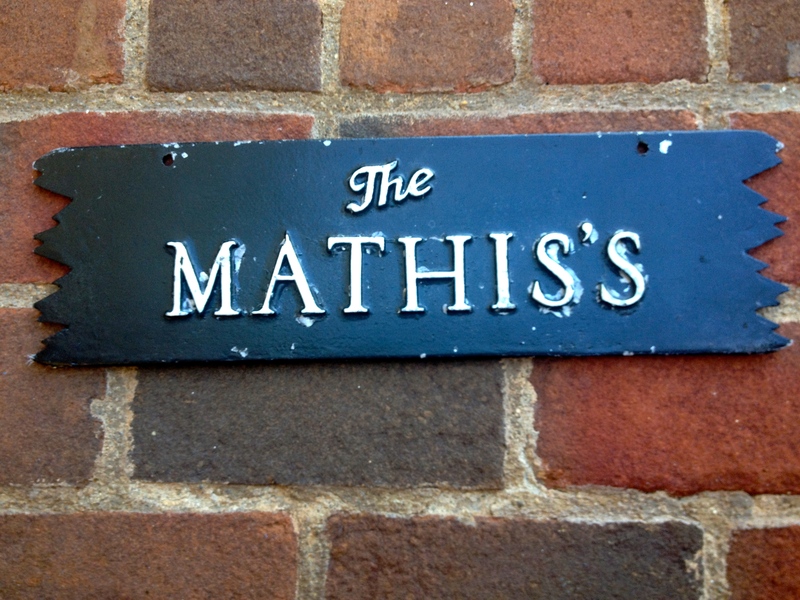 All things Mathis! Hence the name, MATHIS STYLE. Big shout out to R.K. and A.N. for supplying me with the name! I believe the name was a result of a friendly dig, but nonetheless I loved it as soon as I heard it, it was perfect. You will hear about my travels; yep I can recommend a restaurant in the Grand Canyon, how to get into the Magic Kingdom before anyone else and a fun glass shop in Prague as my husband and I are complete airport junkies. I will share my fantastic flea market finds as I am truly in my happy place when I am rooting through someone else’s treasures. Someone who shares my living quarters may refer to these treasures as junk, but I refuse to throw that said person under the bus (for now). If I am not hosting a party I am probably planning my next one…you will hear all the ins and outs of my parties whether you want to or not! Organizing ‘stuff’ is a passion addiction of mine. I have a knack for finding the perfect bin/box/bag to house everyday items and make it look kinda cute along the way. I will share all, well most of my secrets! A girl has to have some secrets. Giving back is important to me. As a family we try really hard to help others…there are lots of ways to do this and I feel passionately about instilling this trait into my kids. Big or small it can be done. And, of course you will read about my team. I would not be able to “get through this thing called life” without them because well, “life, it means forever and that’s a mighty long time” and who wants to tackle life on their own, right?! They are an awesome team, you’ll see!